Reasoning Quotient is a Must. Prepare Now! We can find challenges in every sphere of our lives. Be it finding the best route to a cinema hall on traffic packed roads or choosing the right item in a super market. How best are we equipped to deal with challenges is the question? Reasoning Ability is a systematic process of thinking where a problem or plan is analyzed from various angles in its most practical sense. Hence yields better decisions and better conclusions. That’s why every student’s Reasoning Ability is tested in almost every competitive exam today. The process of learning is dependent on one’s ability to think logically and reason quickly and effectively. These two factors are hence very crucial to a child’s progress in education. Reasoning and logic skills are an integral part of a wide range of subjects such as Math, Science, Design and Technology, etc. These skills are also vital in our day to day lives. This critically important ability of reasoning should be seeded and nurtured in the minds of the students in their budding stage itself. Once the seed of reasoning sprouts in the young minds, the way they see the world entirely changes. Life itself looks like an exciting puzzle to be solved. reasoning are skills that can be developed and honed. To address and fulfill this requirement in our basic education system, Brain Mapping Academy has come up with an innovative and effective solution – Reasoning Trainer Plus. It’s the world’s first Reasoning Curriculum specifically designed by experts to develop the Reasoning and Logical skills (Reasoning Quotient) of the students from Class 1 to 10. With regular practice in solving these questions, the student will feel more confident and better equipped to tackle challenging problems not only in Mathematics examinations but also in real-life situations. Though some children might show this ability naturally, logical analysis and effective reasoning are skills that can be developed and honed. To address and fulfill this requirement in our basic education system, Brain Mapping Academy has come up with an innovative and effective solution – Reasoning Trainer Plus. 3. Which one is different ? 5. What comes next ? 1. Which letter in the Alphabet ? 10. Which one is different ? 12. What comes next ? 15. Which one is different? 17. What comes next ? 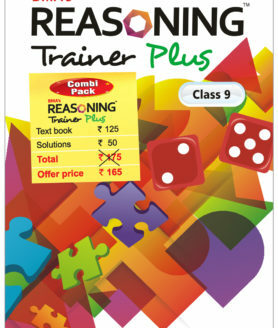 Reasoning Trainer Plus Combo-pack is class wise contains Text Book + Solutions Book. Reasoning Trainer Plus Combo-Pack contains Text Book + Solutions Book (ISBN No. 978-93-82058-15-1). 7. Which one is different ? 8. Which one is different ? 10. What comes next ? Reasoning Trainer Plus Combo-Pack contains Text Book + Solutions Book (ISBN No. 978-93-82058-17-5). 13. Which one is different ? 15. What comes next ? 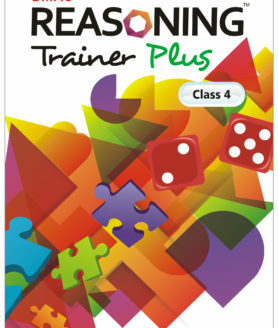 Reasoning Trainer Plus Combo-Pack contains Text Book + Solutions Book (ISBN No.